Lieutenant General Andrey Andreyevich Vlasov rose steadily in the ranks of the Red Army until finally put in charge of one of Stalin’s “shock armies” and entrusted with the defence of Kiev during the German invasion. When his army was encircled and destroyed, Vlasov was captured by the Germans and switched sides. He founded and led a “Russian Liberation Movement” which aimed to free Russia from Stalinist rule and negotiate “peace with honour” with the Third Reich. By November 1944, his Russian Liberation Army, armed and equipped by the Germans, was finally allowed to take to the field, but its only really memorable — and honourable — act was to join up with Czech insurgents and take on the SS in Prague in the closing days of the war. This final switching of sides did nothing to save Vlasov; he and his officers were arrested, taken back to the Soviet Union, where they were tried and hanged in 1946. The story of Vlasov, his movement and above all his ideas is thoroughly tackled in this detailed academic work. The author goes a step too far, I think, when she writes of the 1921 sailors’ revolt in Krontstadt that “many of these attitudes and ideas [of the Kronstadt rebels] are echoed in the programme of the Russian Liberation Movement … The Kronstadters and the supporters of the Russian Liberation Movement shared a common outlook on the achievements of the Soviet state … Both … saw 1917 as the inauguration of a process which could only be brought to fruition by a new ‘third’ revolution.” And so on. I don’t think so. Comparing the rebellious Kronstadt sailors, who were Socialist Revolutionaries, Mensheviks, anarchists and disillusioned Bolsheviks to Vlasov’s “movement”, which was part of the Third Reich’s military forces, is simply wrong and dishonours the memory of the heroes of Kronstadt. 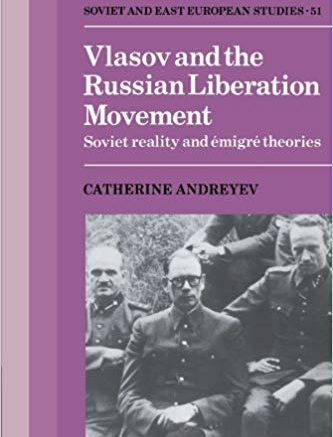 But Andreyev does a service by going into detail about the ideas of the Vlasov movement, even if that movement in the end was little more than an ugly footnote to the history of the second world war.